Today’s inspiration comes from the autumn issue of Cottages & Bungalows magazine. 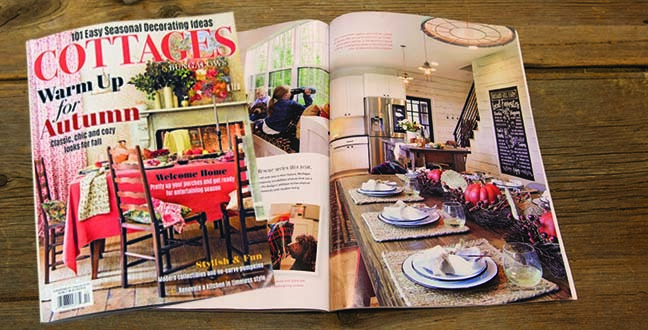 I was flipping through the pages, admiring the gorgeous fall pictures, and one jumped out saying: #MagazineMatch! The tablescape is beautiful and perfect for fall, and even has a touch of Thanksgiving with the turkeys between the nests. I ended up doing a few different versions, and now fall table centerpieces are my new favorite thing! The burgundy pip berry bird nest became the staple that was included in each version. This was a great find and perfect for a country home. The twig base is what really makes it unique. My co-workers thought it was a separate piece that I put together under a regular pip ring. No, my friends, it’s all one wonderful piece! Our 3½” orange pumpkins fit nicely in the nests, and I love how the orange and burgundy colors look together. I wanted to have something between each nest, and the ombre orange and yellow candy corn keeping jar was perfect. The candle resembles a mason jar, which is excellent for achieving a country look, and the raffia bow adds charm! Fall decorating is so fun; between Halloween and Thanksgiving decor, there are a ton of options to get your home ready for the holidays. The next tablescape options I did are geared towards Thanksgiving. If you are hosting this year, these are especially important! Your guests will really love the extra touch as they sit down to your delicious dinner. The change we made from fall to Thanksgiving for this first display was so easy! The candy corn keeping jars were simply swapped out for our turkey tapers! Voilà! The batteries are included with the tapers, so they are ready to go as soon as they arrive to your home! If you are looking for something a little more casual for Turkey Day, this centerpiece featuring our giving thanks turkey, is perfect! I removed one of the nests and put our turkey in the middle instead and surrounded him with our mixed hulu gourds. I just grabbed some leaves at at the local craft store and sprinkled them at the turkey’s feet! Who doesn’t love fall colored leaves?! I know, the turkey is wearing a fancy top hat, so how casual is that, right?! haha! His cartoon style appearance brings extra cheer! I mean, just look at him! And if you want a different look, either for your table or shelf, he pairs nicely with some taper candles! What do you think of these #MagazineMatch centerpieces? Cottage & Bungalows magazine provided some great inspiration, so I hope I nailed it with a KP twist! Let me know in the comments! I would like to know where to get the burgundy pip bird nest and pumpkins for them. What size are the pumpkins ? I love the look .